Chicago Passes Threshold Of 500 Homicides In 2016 : The Two-Way The Chicago murder rate rivals the worst years of the 1990s, when the crack cocaine epidemic turned its streets into a virtual war zone. Most shootings are concentrated in the west and south sides. 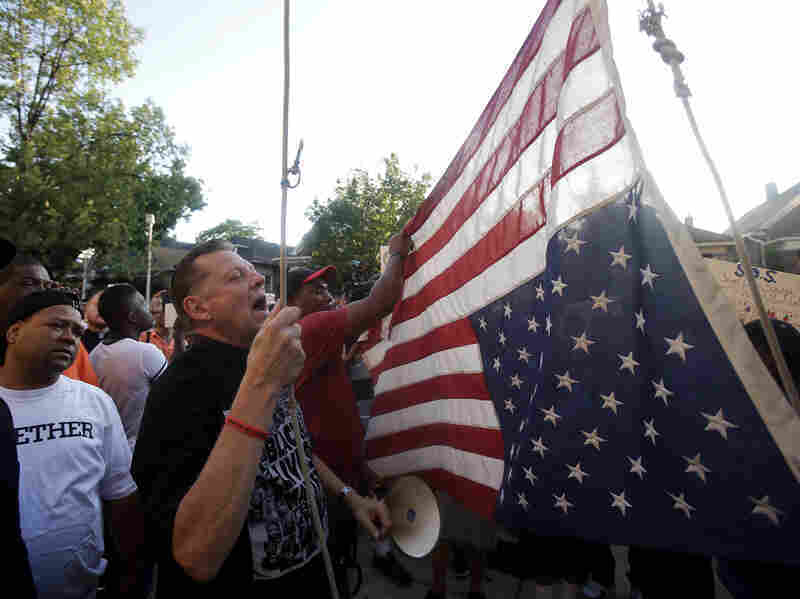 Father Michael Pfleger of St. Sabina Church hangs the American flag upside down outside his church Aug. 31 as demonstrators protest the uptick in homicides across Chicago. Thirteen people were fatally shot over the weekend, bringing the city's annual toll to at least 500. Chicago cemented its reputation as the murder capital of the country with 13 fatal shootings over the Labor Day weekend, bringing the city's annual toll to at least 500 killings. That's more homicides this year than the nation's two largest cities — New York and Los Angeles — combined. The bloody weekend capped off a particularly violent month of August, in which 92 people died — the most in a single month since August 1993, according to USA Today. "The city is on pace to record well over 600 murders for 2016, a threshold it has not reached since 2003. In the 1990s, in the midst of gang violence driven by the crack-cocaine epidemic, Chicago regularly recorded more than 700 murders per year." "After this past weekend's violence, homicides now stand at 512 for the year, according to data collected and analyzed by the Tribune. There were 491 homicides all of last year. More than 2,930 people have been shot this year. "Tribune data is usually higher than comparable numbers provided by the Chicago Police Department because the department excludes killings on area expressways and those that are considered justifiable homicides." As NPR's David Schaper reports for our Newcast unit, in addition to the 13 people slain, another 42 were shot and wounded during the week, the majority in the last hours of the long weekend. "Thirty-one of those victims, including nine of those killed, were shot in just a 21-hour period between 6 o'clock Monday morning and 3 a.m. Tuesday. "Most of the shootings are concentrated in a few neighborhoods on the city's west and south sides that are plagued by high rates of poverty, unemployment and a lack of community investment. "Chicago Police call most of the shootings gang related, but they often involve interpersonal conflicts between members of rival gang factions or neighborhood cliques; and many are in retaliation for earlier shootings."